All Webstrian registered users can have custom domains purchased from any domain registrar. Linking an outside domain to your website requires that you have to change the domain's DNS records and point them to one of our IP Addresses. Changing the sub-domain name of your website into the name of the custom domain. This can be done through Webstrian admin panel. While every domain registrar have its own specifics regarding how to change the DNS records at their control panel, in general the procedure is pretty much the same. The Record Type: In this case this is a record of type "A" and CNAME record type. Step 1: The first step is to log in to your account with your domain registrar and find the Zone File settings, from where you can manage the DNS records. Step 3: The third step depends whether there is “www” record into your zone file or not. If there already exists “www” record, this record should be set to point to our IP address. Edit this record and change the IP address where this record points to. If there is no “www” record then first you should add so called CNAME record. Find somewhere in the Zone File admin interface a button or link from which you can add a new record. For the type for this record choose CNAME type, for the alias for this record enter “www” and for the IP address enter our IP address. 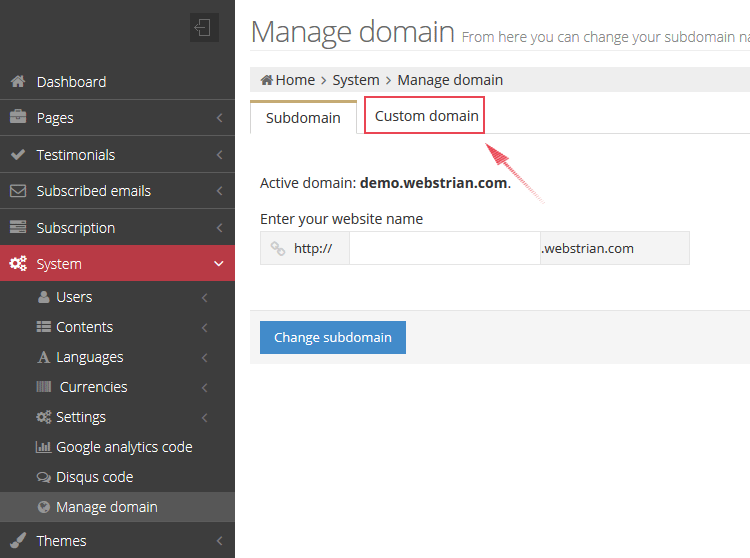 After setting up your domain name at your domain registrar to point to your Webstrian website, the next step is to change the sub-domain into the name of your custom domain. This can be done through your website admin panel. Keep in mind that it can take some time before your registrar makes an update of their servers and changes that you have made are applied. Usually it doesn't take more than a few hours, but it can take up to 48 hours for the registrar to update their servers with a change like this one. The new domain will not start working until their updates are complete. 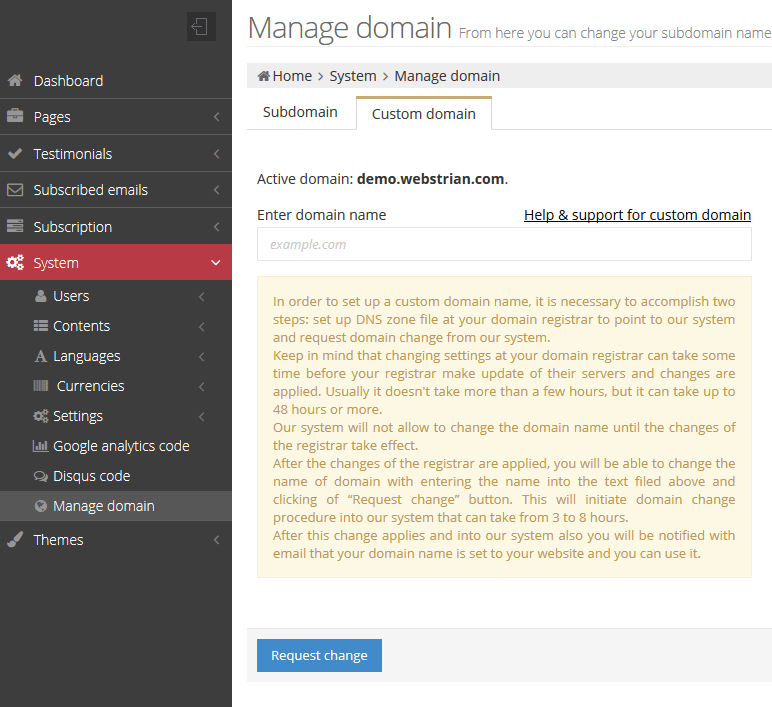 Step 1: Log into your account and under the left menu section “Settings” click the “Manage Domain” link. This will open the page for managing the domain of your site. Step 2: Click on the “Custom Domain” tab. The interface for setting up your custom domain name will be opened. On this tab, into “Enter domain name” text field, type the name of your domain and then click the “Request change” button. If the settings that you have made at your registrar are already in effect, this click will initiate domain change procedure into our system as well. It can take from 3 to 8 hours for the changes to apply into our system. You will be notified with email when the changes are done and after that you can start using your new domain. In case when the changes made at your registrar are not applied yet, then a message will be shown to you that the domain name can’t be changed. If this happens, you will have to try to make this change later. After the change of the domain name of your website is done, the website will be accessible through the new name, and all traffic that comes to the old website name will be redirected to the new one.